This article is about the peninsula in North America. For other uses, see Baja California (disambiguation). The Baja California Peninsula (English: Lower California Peninsula, Spanish: Península de Baja California) is a peninsula in Northwestern Mexico. It separates the Pacific Ocean from the Gulf of California. The peninsula extends 1,247 km (775 miles) from Mexicali, Baja California in the north to Cabo San Lucas, Baja California Sur in the south. It ranges from 40 km (25 miles) at its narrowest to 320 km (200 miles) at its widest point and has approximately 3,000 km (1,900 miles) of coastline and approximately 65 islands. The total area of the Baja California Peninsula is 143,390 km2 (55,360 sq mi). The peninsula is separated from mainland Mexico by the Gulf of California and the Colorado River. There are four main desert areas on the peninsula: the San Felipe Desert, the Central Coast Desert, the Vizcaíno Desert and the Magdalena Plain Desert. The land of California existed as a myth among European explorers before it was discovered. The earliest known mention of the idea of California was in the 1510 romance novel Las Sergas de Esplandián by Spanish author Garci Rodríguez de Montalvo. The book described the Island of California as being west of the Indies, "very close to the side of the Terrestrial Paradise; and it is peopled by black women, without any man among them, for they live in the manner of Amazons". Following Hernán Cortés' conquest of Mexico, the lure of an earthly paradise as well as the search for the fabled Strait of Anián, helped motivate him to send several expeditions to the west coast of New Spain in the 1530s and early 1540s. Its first expedition reached the Gulf of California and California, and proved the Island of California was in fact a peninsula. Nevertheless, the idea of the island persisted for well over a century and was included in many maps. The Spaniards gave the name Las Californias to the peninsula and lands to the north, including both Baja California and Alta California, the region that became parts of the present-day U.S. states of California, Nevada, Utah, Arizona, and parts of Colorado and Wyoming. 1622: A map by Michiel Colijn of Amsterdam showed California as a peninsula rather than an island. Previous maps show the Gulf terminating in its correct location. 1690s–1800s: Spanish settlement and colonization in lower Las Californias (Baja California peninsula), the first Spanish missions in Baja California are established by Jesuit missionaries. 1701: Explorations by Eusebio Kino expanded knowledge of the Gulf of California coast. Kino did not believe California was an island. 1767: Jesuits expelled; Franciscans take over the Baja missions. 1769: Franciscans go with the Portola expedition to establish new missions in Alta California. Control of the existing Baja missions passes to the Dominican Order. 1773: Francisco Palóu's line demarcates Franciscan and Dominican areas of mission control. 1804: Las Californias divided into Alta ("Upper") and Baja ("Lower") California, using Palóu's line. 1821: First Mexican Empire, Baja California Territory established, covering Baja California Peninsula. 1847: The Battle of La Paz and the Siege of La Paz occurs, as well as several other engagements. 1848: Treaty of Guadalupe Hidalgo cedes Alta California to the United States. As a U.S. territory it receives the California Gold Rush, causing increased maritime traffic along the peninsula. 1850: California admitted to U.S. statehood. 1930–31: The Territory of Baja California is further divided into Northern and Southern territories (North Territory of Baja California and South Territory of Baja California). 1973: The 1,700 km (1,100 mi) long Trans-Peninsular Highway (Mexican Federal Highway 1), is finished. It is the first paved road that spans the entire peninsula. The highway was built by the Mexican government to improve Baja California's economy and increase tourism. The province of the Californias was united until 1804, in the Spanish colonial Viceroyalty of New Spain, when it was divided into Alta (upper) and Baja (lower) California. The two Californias division was kept after Mexican independence in 1821. The Spanish Baja California Province became Mexican Baja California Territory, and remained a separate territory until 1836. In 1836, the Siete Leyes constitutional reforms reunited both Californias in the Departamento de las Californias. After 1848, the Baja California Peninsula again became a Mexican territory when Alta California was ceded to the United States (see 1854 map). In 1931 Baja California Territory was divided into northern and southern territories. In 1952, the "North Territory of Baja California" became the 29th State of Mexico as Baja California. In 1974, the "South Territory of Baja California" became the 31st state as Baja California Sur. The northern part is the state of Baja California. The citizens of Baja California are named bajacalifornianos ("Lower Californians" in English). Mexicali is the capital. The southern part, below 28° north, is the state of Baja California Sur. The citizens of Baja California Sur are named sudcalifornianos ("South Californians" in English). La Paz is its capital. The Baja California Peninsula was once a part of the North American Plate, the tectonic plate of which mainland Mexico remains a part. About 12 to 15 million years ago the East Pacific Rise began cutting into the margin of the North American Plate, initiating the separation of the peninsula from it. Spreading within the Gulf of California consists of short oblique rifts or ridge segments connected by long northwest trending transform faults, which together comprise the Gulf of California Rift Zone. The north end of the rift zone is located in the Brawley seismic zone in the Salton Sea basin between the Imperial Fault and the San Andreas Fault. The Baja California Peninsula is now part of the Pacific Plate and is moving with it away from the East Pacific Rise in a north northwestward direction. Along the coast north of Santa Rosalia, Baja California Sur is a prominent volcanic activity area. Researchers from Scripps Institution of Oceanography have found a 2,000-year-old layer of non-decomposed roots, or peat, up to four meters (13 feet) under the desert mangroves. The peat layer acts like a sponge for stored atmospheric carbon, a record of sea-level-rise is also recorded in the peat layer. The desert mangroves restricted to rocky inlets on the rugged coast of Baja California have been growing over their own root remains over thousands of years to compensate for sea-level rise, accumulating a thick layer of peat below their roots. However, mangroves in flat coastal floodplains have accumulated a thinner peat layer. The Peninsular Ranges form the backbone of the peninsula. They are an uplifted and eroded Jurassic to Cretaceous batholith, part of the same original batholith chain which formed much of the Sierra Nevada mountains in U.S. California. This chain was formed primarily as a result of the subduction of the Farallon Plate millions of years ago all along the margin of North America. The Sierra de Juárez is the northernmost range in Mexico. The Sierra San Pedro Mártir runs south of the Sierra Juarez and includes the peninsula's highest peak, the Picacho del Diablo. The Sierra de San Borja runs south of the Sierra San Pedro Martir. The volcanic complex of Tres Virgenes lies in Baja California Sur, near the border with the state of Baja California, forming the ranges south of the Sierra de San Borja. 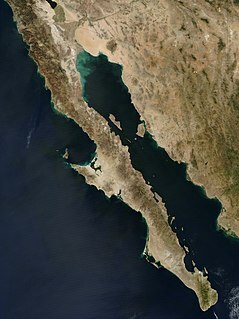 The Sierra de la Giganta runs along the shore of the Gulf of California south of the Tres Virgenes complex. Another isolated range, the Sierra Vizcaino, juts out into the Pacific between Punta Eugenia and Punta Abreojos. The two most prominent capes along the Pacific coastline of the peninsula are Punta Eugenia, located about halfway up the coast, and Cabo San Lazaro, located about a quarter of the way north from Cabo San Lucas. The Bahia Sebastian Vizcaino, the largest bay in Baja, lies along the Pacific coast halfway up the peninsula. The large island of Isla Cedros is situated between the bay and the Pacific, just north of Punta Eugenia. Onshore southeast of the bay is the Desierto de Vizcaino, an extensive desert lying between the Sierra Vizcaino to the west, and the Tres Virgenes range which runs along the Gulf of California to the east. The largest bays along the coastline of the Gulf are Bahia de La Paz where the city of La Paz is located, and Bahia Concepcion. 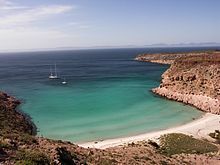 The Bahía de los Ángeles is a small bay located west of the Canal de las Ballenas which separates the Baja California peninsula from the large island of Angel de la Guarda in the Gulf of California. The peninsula is home to several distinct ecoregions. Most of the peninsula is deserts and xeric shrublands, although pine-oak forests are found in the mountains at the northern and southern ends of the peninsula. The southern tip of the peninsula, which was formerly an island, has many species with affinities to tropical Mexico. The Sonoran Desert extends into the northeastern portion of the state, east of the Sierra Juárez and Sierra San Pedro Mártir ranges. The Baja California Desert extends east of the Peninsular Ranges along the Pacific side of the peninsula for most of its length, and includes the El Vizcaíno Desert and El Vizcaíno Biosphere Reserve. The peninsula is known colloquially as Baja by American and Canadian tourists, and is known for its natural environment. It draws ecotourists who go whale watching for migrating California Gray Whales as well as tourists that arrive to the Baja California Gold Coast and resorts on the southern tip of the Peninsula. Its location between the North Pacific and Gulf of California give it a reputation for sports fishing. ^ Barkenbus, Jack, "The Trans-Peninsular Highway: A New Era for Baja California", Journal of Interamerican Studies and World Affairs, Vol. 16, No. 3. (Aug., 1974), pp. 259–273. ^ Baja California, it is sometimes informally referred to as Baja California Norte, to distinguish it from both the Baja California Peninsula, of which it covers the northern half, and the adjacent state Baja California Sur that covers the southern half of the peninsula. While it is a well-established term for the northern half of the Baja California Peninsula, however, its usage would not be correct, because Baja California Norte has never existed as a political designation for a state, territory, district or region. ^ "New Study Shows Desert Mangroves Are Major Source of Carbon Storage | Scripps Institution of Oceanography, UC San Diego". scripps.ucsd.edu. Archived from the original on 2016-04-09. Retrieved 2016-03-30. Wikimedia Commons has media related to Baja California peninsula.